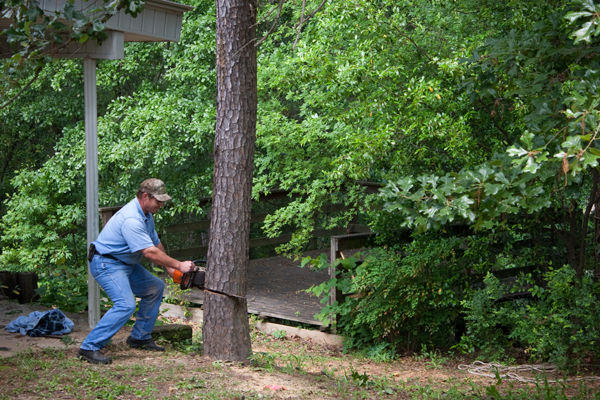 We hired a couple fellas to cut down a dead tree in our backyard the other day. It wasn’t the most fun home improvement money we’ve ever spent, but apparently home owners insurance doesn’t cover damage caused by dead trees, so it had to be done. I know. I was thinking the same thing. 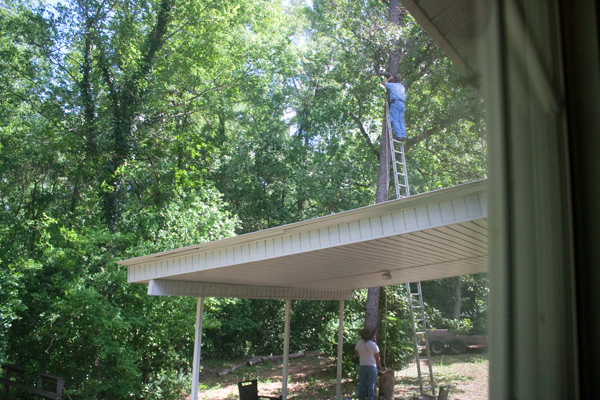 Why is dead tree removal guy #1 not holding the ladder for dead tree removal guy #2?! I could barely watch. Especially when #2 shifted the ladder to the left and right while he was up there working. So freaky! They say that the best time to plant a tree was 20 years ago, and the 2nd best time to plant one is today. Time to find my shovel. we have a dead pine in our backyard too. i’m not looking forward to having it cut down since my pocketbook still hurts from having 3 trees cut down last year. tree removal isn’t cheap!! If it makes you feel any better, we paid over $600 to remove a living but monstrous 40-foot pine that was too near the house. That price included the stump-grinding, though. Hmmm. Sounds like a steal to me. Mine was $1200. Granted, it was a giant walnut tree, but the price was ridiculous. AND the cheapest estimate. They only hauled the debris 52 feet to my neighbors and charged me $500 for “removal.” Needless to say, I was not happy. Yikes! That is expensive! :-O I guess we’re in the wrong business! a gust of wind came and took down the man and the limb. By the grace of God they landed in different places. I love that! …2nd best time is to plant one now. 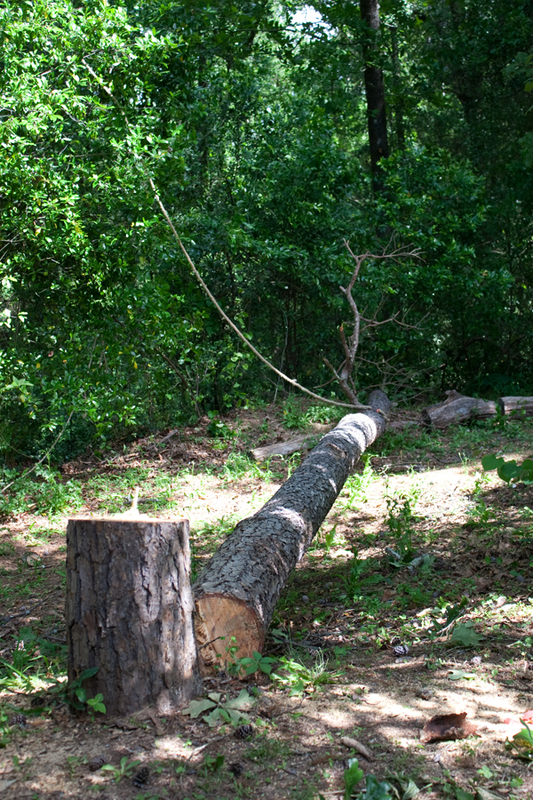 Dead trees do need to be removed if they are in danger of falling on something or someone, but one thing to keep in mind if you have a dead tree is to not cut it down all the way. If you can leave 15 feet or so standing you will provide a great natural habitat for so many native critters. I know that’s not the most appealing look, so I guess I wouldn’t do it on a tree I look at every day, but if you don’t mind the look you’ll be doing a great thing for the environment. And holy smokes … $300 for one tree? Yikes. I’m not going to tell you what we just paid to have five cut down. I know how you feel. We had a tree service take down an oak that was at probably over 100 years old.We knew we did the right thing when we saw that the trunk was hollow all the way down to about 3 feet from the ground. Money well-spent. Dead trees are just dangerous. Think of it as an opportunity to replant something gorgeous! And who doesn’t love a trip to the garden center? As for the cost….take into consideration how close it is to your home….the height and the branch spread….is it in an accessible area? It isn’t uncommon to spent $1k for one tree, just depends. I like the idea of leaving part of it as a natural habitat. 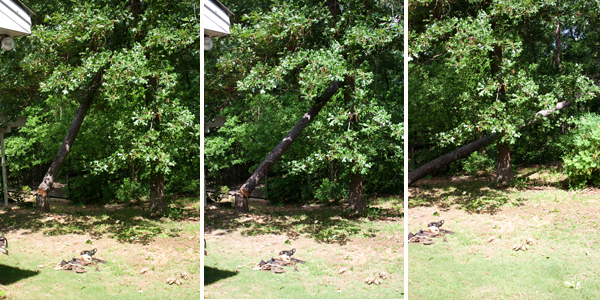 We have a neighbors dead limbs hanging over out soon-to-be patio…going to get that taken care of. $300 sounds like a good deal to me! Our estimates have been much higher than that, now we have second tree to add to it. It is sad to have to spend home improvement money like that. But on that bright side, at least your home is more likely to stay safe now that the tree is gone. We only have one tree on our property and I hope we never have to do anything to it. It’s in such a hard to get to area I know it won’t be cheap. 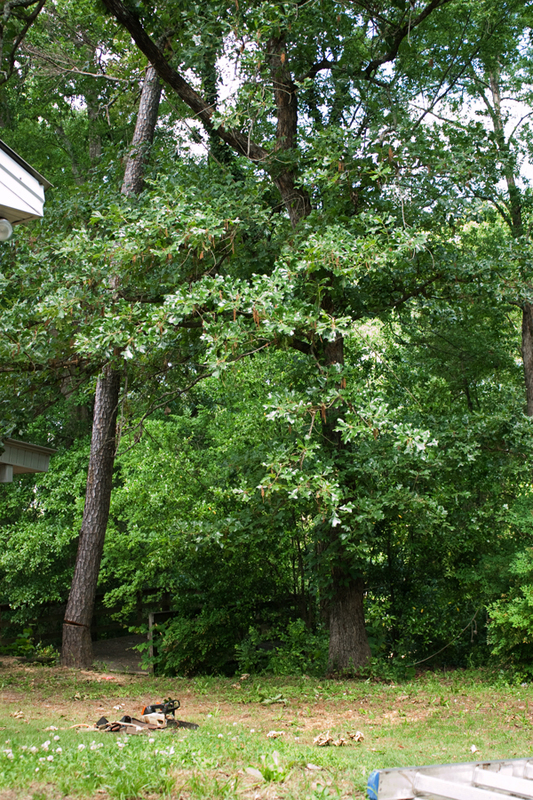 It’s so sad when a tree has to go – I love my trees but when they die it’s time to let them go:) We had to have 18 trees cut down in the fall – they died as a result of oak wilt and the TX drought. It was a sad few days. Before Hurricane Isabel we had 11 trees growing down the side of the driveway; after Isabel we had 2 trees. They pulled out of the ground like pops. Make sure is you hire a landscaper he knows how to plant a tree. Dig a bigger hole that the root ball, cut away any and all string, wire or burlap. Plant with great dirt and water every dry spell for at least five years. Please forget to water their trees during the dry spells and then wonder why a tree dies. Happy planting! I don’t do heights and could not have watched Tree Remover Guy #2. Yikes! Hi Layla…wish I’d know ya’ll needed a tree cut down…hubby has a contact that does his tree work and maybe could have given you a better price….maybe next time! Looks like more sunlight will be coming to your yard. I was wondering about guy not holding ladder. I wonder odd things like that i.e. watching ncis l.a. Wondering why mansion doesn’t have alarm so ncis girl can’t pick front door lock! Oh well. Always so scary to look at. My husband cuts down trees for his day job and every time he leaves in the morning, I say “Be Careful.” I can’t stand to watch Ax Men on TV either, I watch it through squinted eyes. Hubs loves to watch it though. Now is the time to read you policy 🙂 Seriously, knowing what we have to do under certain circumstances so the policy WILL cover problems is something all homeowners should become familar with and of course each policy will be different. And no policy will cover a nuicance and a dead tree is one. And lawsuits can cost a lot more. I think we should all follow up on the hoses, dryer vents, shut off valves for water…..look at our policies. Maybe you could buy the top of a bird bath or find something like a very large, shallow bowl to use the stump as the base of a bird bath. I wonder if you could even find a way to “dig” a bowl out of the stump! That would be a really neat feature in a yard, and it would turn a dead tree stump into something cute and useful! We had an estimate for tree removal just this week. Hubby immediately rolled his eyes and said we could do it ourselves. Uh, no. The tree removal cost vs. the cost of emergency room trips is worth every pretty penny, thankyouverymuch. My necessary home expense last week was $700+ for plumbing problems. Wanted to spend it on French doors for my closets … but I also like using my dishwasher, shower and toilet!!! WHAT? You let them take all the wood? I can’t believe you didn’t have them leave some for a few house projects. Like those cool stump-looking end tables, stools and benches? I just bought one (for $100) until I can make one of my own. Oh well, at least the house will be safe for storm season. i have a hard time on the ladder painting our eaves that only about 15 feet off the ground(gotta love ranch house style!). of course that is probably why the 25 ft section is still unpainted! Good info on the insurance/dead tree thing. Will be lining the pockets of some over-paid tree cutters soon. Wouldn’t it be nice to be able to sell that wood to some company who would pay YOU to chop it down? Lindy, I like how you think! I agree! had some trees removed recently as well. only the friend that cut ours down climbed a ladder then sat in the tops of the trees barefoot while holding a chainsaw to cut them down….talk about scary. but like you said…it had to be done!! We bought a house when I was a kid (or rather… my parents did), and there were 32 giant pine trees crammed into the teeny front yard. They had to go too. Way to close to the house. It was a sad day though, watching them all being cut down:( But it was nice to see the light of day after they were gone and no longer blocking the view from every window! It’s so sad to me to lose a tree! Even sadder to have to plant one when all we can afford is a tiny little baby that won’t be big for another 25 years 🙂 Hopefully you can plant a bigger one! Not very safe those guys… No hearing protection, no safety glasses, not holding the ladder,,,,, YIKES !!!!!!!!!!!!!!!! 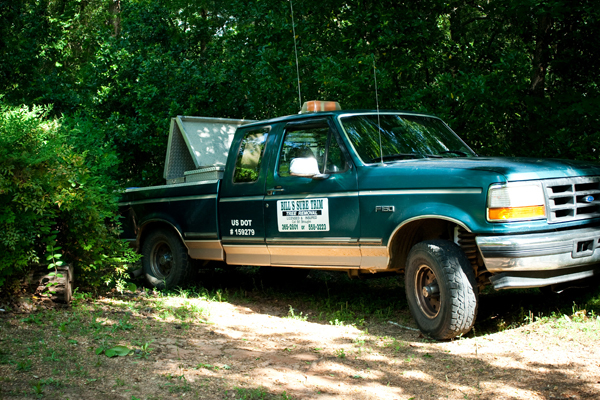 We never spend money on dead tree removal! Next time, just post an ad on Craigslist saying, FREE FIREWOOD or FREE WOOD! Then in the details say they can have all of the wood from the tree, but they have to cut it down. (Wood can be expensive!) We’ve 3 Trees cut down by 3 different people like that! 🙂 We’ve got 6 kiddos, so I’m always looking for ways to save. There’s also bartering too. Mama, I love ya, but please amp up the post!!!! Oh, dang, I am not trying to be mean, but I know I am goning to come across that way…I guess I mean, a little more DIY in the posts, a little more meat, a little more something I can use…..uggghhh…I am a horrible person, huh?!!!!!! A storm took down a couple of the huge old trees in our yard…but many, many large branches were broken of some of the trees that were left. It cost us a bundle to have someone (who knew what they were doing) come and trim those branches and cut up the trees that fell. No possible way could we have done it ourselves. It was money well spent but it did break my heart to lose those beauties. love seeing this process. glad everyone is safe! Love your blog Layla! It’s like visiting a friend. I don’t expect friends to teach me anything. Sometimes it’s just nice to talk and share 🙂 Blogs are cool like that! That was pretty boring to see. enjoy! 🙂 i find that it’s better even than OHMYLANTA! or GREAT GOOGLY-MOOGLY! I hate spending money on stuff like that! Even when it has to be done. ugh. I am considering writing a book called 100 UN-FUN ways to spend your money. This year we added to our list: new roof due to hail damage ($11,000), new gutters $1,000 (not a bit of fun in that one), termite treatment $800. (made me want to hurl, twice), Cobra health insurance for two months ($2,600), ER visit ($1,300), and garage door spring replacement ($300). All in the last four months. Not the best start to 2012. $300 is nothing. We paid $1900 to have a double trunk (with half downed by winds) removed and the stump ground. Please tell me you had the foresight to have some of the trunk cut into suitably sized pieces so you can make side tables or stools. Not fun to spend, but it’s great (and responsible!) that you had it done. 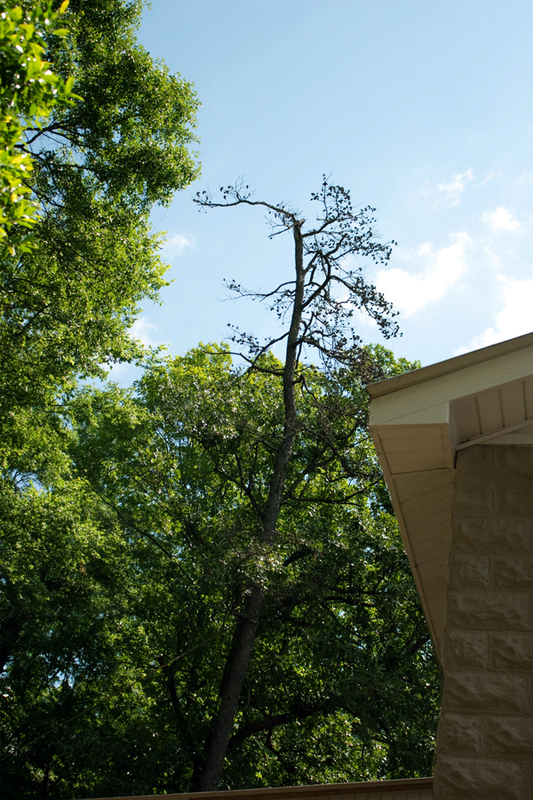 You don’t just have to worry about a dead tree falling on your home. They can also fall and hurt or even kill people. You chose well when you chose Bill Straughn to do your trees. He does a great job and is a very good man.